Welcome to the Math Salamanders Printable Division Sheets 4th Grade. Here you will find a wide range of free 4th Grade Math Worksheets, which will help your child learn to use their division facts to find related facts. 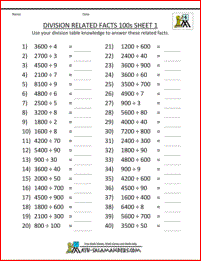 Here you will find a selection of Division sheets designed to help your child learn to use their Division facts up to 10x10 to answer related questions involving 10s and 100s. For example, if you know that 42 ÷ 6 = 7, then you should be able to use the fact to answer questions like 420 ÷ 6 or 420 ÷ 70, etc. apply their division facts up to 10x10 to answer related questions involving 10s and 100s. We have some 3rd Grade Division worksheets. This page focuses on working out division facts related to the multiplication table. 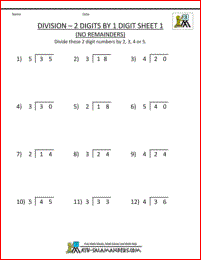 We also have long division worksheets 3rd grade both with and without remainders. 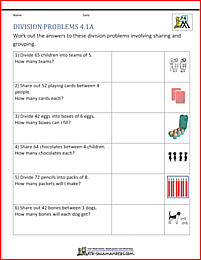 Here you will find a range of Free Printable 4th Grade Division Worksheets. 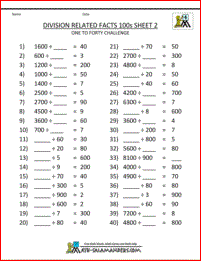 The following worksheets involve using the Fourth Grade Math skills of dividing, and solving division problems. plot and write coordinates in the first quadrant.